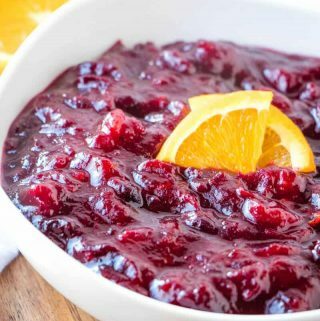 Easy, flavorful and perfect for your next holiday gathering this Homemade Cranberry Sauce is our go to recipe with minimal ingredients and time! In medium saucepan add your sugar, orange juice, water, cinnamon, cinnamon stick, salt and cranberries. Over medium high heat bring to a simmer until cranberries start to pop and continue stirring occasionally for about 15-20 minutes until slightly thickened and popping stops. Pour into serving dish and cover and refrigerate until chilled, about 30 minutes.